You may not see them among the flurry of activity at Paducah's annual Barbecue on the River. They are shrouded by layered veils of smoke emanating from barbecue pits beyond the public's view. They toil, around the clock, for days. Many sleep at the festival, tending to slow-cooked ribs, chicken, and pork butts. They are the lifeblood of one of Paducah's biggest parties. They are the pitmasters. William Gilbert is one of these masters of meat. He's been at the helm of the Fraternal Order of Police team since 2003. Growing up with great uncles, a father, and grandfather who barbecued in block pits, it was already in his blood. When the Fraternal Order of Police brainstormed about new ways to raise funds, William's family history seemed like a natural fit with the fund-raising aspect of Barbecue on the River. "In the past, the F.O.P. 's main fundraiser was telemarketing," he says, "but as police officers, we're telling people to be cautious about giving money over the phone. It didn't feel right, and we just didn't like telemarketing. My dad encouraged me to get into Barbecue on the River. He loaned us the equipment the first year, and now it's become our primary fundraiser, mostly for scholarships for local schools and taking needy families Christmas shopping each year." In the team's early years, they were known as Cookin' Pigs with a uniformed pig as their mascot. With the addition of police officers and pitmasters Brian Kopischke and Nathan Young, they changed their name to The Regulators and branched out into doing catering jobs beyond the annual festival. The pig lost its uniform but kept a badge as a nod to their profession. "And that first year we were down here, I have to admit, we were horrible!," laughs William. "We were next to the Buzzard Brothers, and they spent more time in our tent than they did their own. We just kept messing stuff up! Johnny Rottering really took us under his wing as did many others and taught us a lot of what we needed to know." 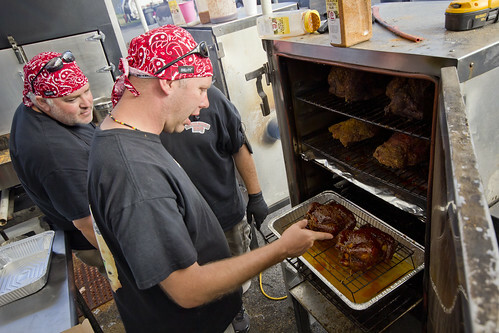 As William thinks back over the help and camaraderie among the pitmasters, he wells with emotion. "Our hog pit was built by Deputy Chad Shaw who passed away," he says, fighting back tears. "Barbecue brings about a lot of emotions. We've lost a couple of team members over the years. Norman Roberts was working here on a Friday one year and went home that night and passed away. This was a pretty big event for them." William pauses for a moment as he sits in his booth, remembering those who have touched his life through a shared passion for barbecue. "All of us down here become family. I've had help with things like knife sharpening, and I've done things like running errands for others. So we are family. That changes a bit when we hit the competition," he laughs, "but we are here to help one another." William now donates his life for a week to Barbecue on the River, raising much needed funds for the FOP and helping others who are just getting started. "Brian and I take vacation, and the police department has been gracious to allow us to do that during this busy time," he says. "And I stay here for the duration. I have a suitcase in my truck and stay in a camper. Once I fire the pit, I don't shut it down until Saturday afternoon." William, Brian, and Nathan cook case after case of meats to serve the hungry throngs. They also focus on preparing for competitions. The Regulators improved year after year, amassing trophies for categories such as pulled pork, chicken, whole hog, and sauce. The team is fastidious about their food. They take into account looks, scent, and, of course, taste. They sample, savor, and scrutinize their work as they stand among a small labyrinth of cookers behind their booth. The king of the the competitions is whole hog. 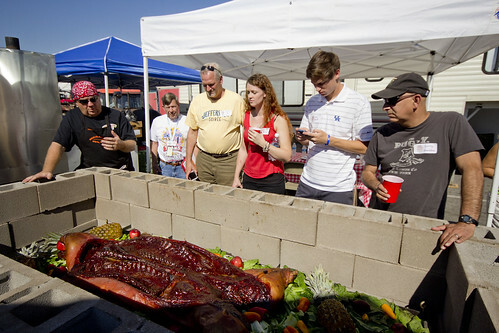 For the 20th anniversary of Barbecue on the River, William felt nostalgic and built a special, old-school block pit to smoke their masterpiece. "We'll spend all night on this," he says. "Johnny Rottering taught me whole hog, and we won it the first year we did it. He was pretty proud of that. We actually dressed the hog in uniform and had donuts and coffee cups around it. Danny Sims, the coroner, even came in and did a death pronouncement due to low and slow smoke. It was fun!" Just before the judges visit their booth, The Regulators remove the cover from the pit. William spreads sauce across the hog, and the team fastidiously places lettuce, apples, pineapples, and sweet peppers around their creation. Each piece is placed strategically. Every green leaf has its place. The judges' eyes grow wide with amazement as they barely contain their desire to have a taste. After a brief presentation by William, they are seated and served samples of the meat. Their silence, only broken by the occasional mmmm and oooh tell the story. After the judging is done, the last festival-goer has gone home, and the smoke has cleared, Will, Brian, and Nathan pack up. The work is intense and they are exhausted, but they've added skills to their barbecue belts, and they've helped grow this community. It comes not only from the dollars and cents that the F.O.P will use to help others but from the kinship strengthened among those behind the tents and booths. Among the pork, chicken, and coals, a network of family forms and its ties are strengthened across a patchwork of people bound together by barbecue.